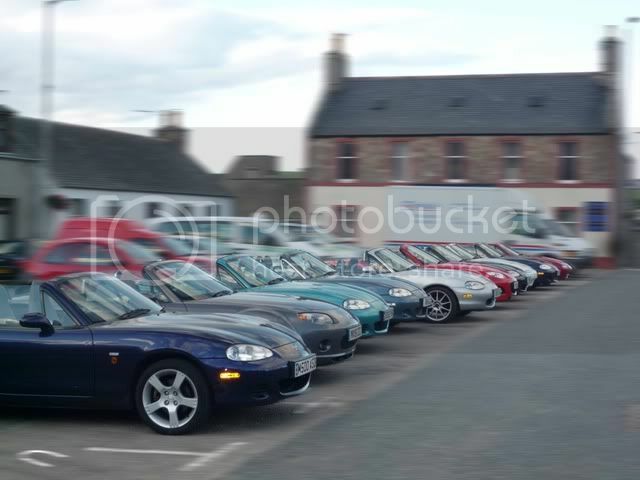 Second chip run of this years series, meet at Morrisons Inverurie for a hurl into the countryside for a poke of chips. This second run will be to Foggie (Aberchirder). Event is subject to possible movement by a day either side dependant on the weather. Keep an eye on the forum for the latest details. Great - looking forward to visiting Foggie again. Looking forward to this. Will be my first run with the club too. Not sure whether my furry nav will make it depends on his mood. Si, looking forward to meeting you, I'll PM you my mobile number in case you run into any problems. We should be fine........see you all at 18.30. Just had a quick look at the weather report for tomorrow and it looks like this rain is going to clear away to leave a sunny day (highs of 20 degrees) and a clear evening. Thought I'd upload three photo's from today. Sorry I missed it guys, did plan to meet up but was called back in to work last thing. Good to meet you Si, glad you enjoyed the run. Nice pics too, in the last one which technique/tool are you using to blur the area that is not the cars? The last photo is editted on photoshop elements. Its done using a dual layered picture. The first layer is everything blurred with the normal picture underneath. Then you erase the area you want not to blur on the blurred layer. Its a great technique to give an extra impression of speed on a still photo. What's the betting that the renowned chip guzzler- Lorraine was in action here?? I have read a few posts -that you have to be on your guard if you have a bag i hand - seems if she 's around- then you will be mugged!! I do like my chips- but a wee bit far to go for them- I do tend to cook a very crispy & crunchy number- on my cooker... but am quite greedy- tend to scoff the lot- then Simon- my son- goes you ate all these??? Anyway- see you all soon- one of these runs! Best Regards to you all! Forgot to say - photos were great!- Who cares if they are not quite up to David Bailey standards-just show a perspective of folks having a good time- who's blurry then..sometimes an amateur can catch an angle that even an expert can't envisage! So keep them coming everybody! P.s ... I have guzzled all my chips!! Yes, good run last night. My stand-in co-driver thoroughly enjoyed himself. He made some daft remark about meeting "a nice bunch of folk" - he must have sneaked out of the chip shop for a little while and wandered around Foggie on his own when that happened! I think that must be the largest number of cars that's been on a chip run. Forgot to say pleased that The Pram found her hat - and I know where Hillhead of Lethenty is! 10 on Wednesday, I'm pretty sure we've done more than that on a couple of occasions, I'd need to go back and look at the photo's but Dufftown last year quite likely and I'm sure one other.